Blogs and Journals in Blackboard look and behave in similar ways. They both provide Blog like features and functionalities. The key difference between the two is that Blogs are shared within the course, and journals are usually private. You can have any number. Anyone can post to it. Need to set up groups to use it. Any member of group can post. Anyone else can view and post comments. If you want this then add a Blogs tool link in your course menu to give users an easy way to access all blogs. You can choose whether non-group members should be able to view posts by group members or not. No anonymous posts nor comments. Accessed via Blogs screen or by adding Blog to Content area from Tools menu. Each user has their own area where they can post (they click on their own name to find it). All other students can read and make comments. These are best added within a Content area from Tools menu. Each user has their own journal. Instructors can set the journals to be private or shared. A private journal can only be viewed by the student themselves and the instructor, the shared journal can be read by all course users. When using blogs it can be beneficial to add a blog link to your course menu. Group Blogs can be enabled when creating a Blackboard group. See the guide for more information on setting up groups. If you have already made a group and want to enable a blog for that group follow the guide below. Be aware the group blogs are not private to the group. Any other course user may read other group’s blog entries and make comments. 1. Find the group for whom you wish to enable blogs in the Groups area (found via Control Panel -> User and Groups -> Groups), click on the Modify button beside the group and click on Edit. 2. Under the Tool Availability section tick Blogs. 3. If you wish you can choose to have a Grade Centre column added for this blog. Group Blogs can be found in the following ways. 1) From the general blogs area accessed via Control Panel -> Course Tools -> Blogs. 2) From the Control Panel – Users and Groups – Groups menu. 3) Students and instructors who have been made members of the group can access the blog also in this way. 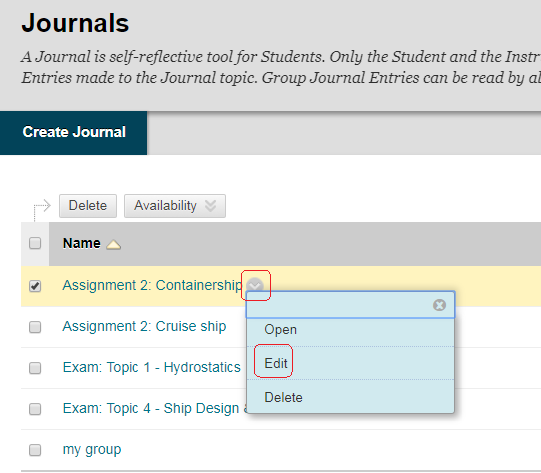 Group Journals can be enabled when creating a Blackboard group. See the guide under what’s related for more information on setting up groups. If you have already made a group and want to enable a journal for that group follow the guide below. Be aware the group journals should be private to the group. However the extra step detailed at the end of this guide is necessary to achieve this. 1. Find the group for whom you wish to enable journals in the Groups area (found via Control Panel -> User and Groups -> Groups), click on the Modify button beside the group and click on Edit. 2. Under the Tool Availability section tick Journals. 3. If you wish you can choose to have a Grade Centre column added for this journal. Group Journals can be found in the following ways. 3) Students and instructors who have been made members of the group can access the journal also in this way via the Groups menu. To ensure that students who are not in a group cannot see that group’s posts do the following. 1. From the Control Panel, expand Course Tools and click on Journals. 2. Find the group journal in question and click on the action button beside it and click on Edit from the menu that appears. 3. 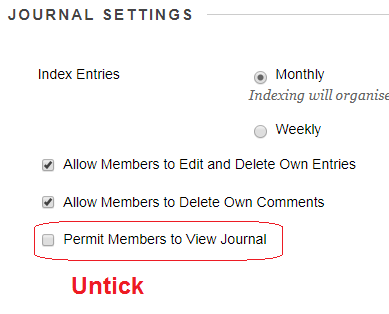 Scroll down to Journal Settings and untick “Permit Members to View Journal”. Repeat the above process for any group journals where you wish for them to be private from the other groups. Individual Blogs are blogs where each course user has their own blog area that only they can post to. All users can read each other’s posts and make comments. 1. From your course’s Control Panel expand the Course Tools menu and click on Blogs. 2. Any existing blogs will be shown here. Click on Create Blog. 3. Enter a Name and any instructions. For instructions you may wish to inform your students while they each have their own individual blog, all course users can read their blog entries and make comments. 4. For students to be able to access the blog, Blog Availability must be set to Yes. 5. If you wish you may place date and time limitations on when this blog will be available to students. 6. Set the Blog Type to Individual to all Students. You may choose to allow comments if you wish. iSolutions cannot identify who made anonymous comments. Therefore only enable this option if you are certain you will never want to identify the person who made an anonymous comment. Index Entries: Choose for entries to be indexed in a monthly or weekly format. Allow Users to…: Choose whether you wish users to be able to edit and delete their entries and / or comments. 7. If you wish to add a Grade Centre column for the blog choose to Grade Blog and set the maximum number of points possible to score for the work on the blog. 8. Click on Submit to finish. 9. You will see the blog you have created. To enter it click on it. Note that you may click on the Modify button beside it to bring up the edit menu. 10. You may want to add a link in your course menu to the blogs area. See the guide on our website. Individual Journals are journals where each course user has their own journal area that only they can post to. Only the student themselves and course instructors may view their posts and add comments. 1. You can add Journals in a number of ways. In this guide we will start by adding the journal into a course content area. From any content area hover over the Tools button and choose Journals. 2. Click on Create New Journal. 3. Enter a Name and any instructions. For instructions you may wish to inform your students they each will have their own individual journal, and that unless you (the instructor) choose otherwise in the subsequent options no other students will be able to read their journal or add comments to it. 4. For students to be able to access the journal, Journal Availability must be set to Yes. 5. If you wish you may place date and time limitations on when this journal will be available to students. Permit Course Users to View Journal: If this option is selected then all students will be able to read each other’s journals. This option could be useful if you would like to open up the journals at a later date so students can see how their peers dealt with their journals. 7. If you wish to add a Grade Centre column for the journal choose to Grade Journal and set the maximum number of points possible to score for the work on the journal. 9. The journal you created should now be in the Link to a Journal box. Click on Next. 10. This final stage is to complete creating the link to the journal. Set the options as you wish. It is wise to add some contextual information in the Text box. 11. The journal has been created. To access it click on the link. If you wish to go back and change the options go through Control Panel -> Course Tools -> Journals, and click on the modify button beside the journal you wish to change. 1. You can tell which type you are using by clicking on the Blog Details link in the box to the right of the blog posts. Individual Blog: Each person has their own area of the blog and by default see their own entries. However every user also can view each other’s posts. 2. In the middle of the box you can see who else has made posts in the blog by clicking on the All Course Members box and click on their name to view their posts. You may also use the [<] and [>] arrow buttons to move between people’s posts. 3. The final section of the box shows a breakdown of entries per week or month depending on how it has been set up by the instructor. 4. To create a blog entry click on Create Blog Entry. 5. Enter a title and then fill in the larger text box with your entry. Note that if you plan on pasting text into the text box from Microsoft Word, make sure to use the Paste From Word feature described in step 7.1 of this guide. 8. If permitted you may choose to make your post anonymously. 9. If you wish you can attach a file by using the Browse My Computer button. 10. Click on Post Entry to finish. “Blog” is short for Web Log, and is a term used to describe a journal or diary that is online. You may use blogs in your Blackboard course. Blackboard uses the terms “blogs” and “journals”. Blogs are shared within the course while journals are usually private between the instructor and student. These guides explain how to use and set up Blogs and Journals. Find out what the difference is between Blogs and Journals. This guide covers using Blogs, from understanding the user interface to creating a blog entry. This guide explains how to set up Blogs for your whole course to use. A Course Blog will show posts one below the other as you would expect. This guide explains how to enable blogs for groups that you have already created in your Blackboard course. This guide explains how to set up “individual” blogs (where each student has their own blog that is readable by all other students). Individual blogs show only the posts of the user currently logged in. They can view the posts by other course members by clicking on that person’s name in the list displayed on the right. This guide will show you how to add a Blogs entry to your course menu. It will also show you how to add a direct link in your course menu to a specific blog. This guide covers using Journals, from understanding the user interface to creating a blog entry. This guide explains how to set up “individual” journals. These are blogs where each student has their own journal and only they and the instructor can access it, unless the instructor opens it up to the whole class. This guide explains how to enable journals for course groups that you have already created. 1. There are two types of journal in Blackboard. You can tell which type you are using by clicking on the Journal Details link in the box to the right of the journal posts. Group Journal: Only Group Members can post and only group members and instructors can view the entries and add comments. Individual Journal: Each person has their own journal and by default see only their own entries. Only instructors can view user entries unless the instructor enables all students to view each other’s entries. Note that it is difficult to tell whether an individual journal really is private, especially if the instructor does not make this clear within their descriptive text. To be sure click on the Tools menu and then Journals to get to the list of all Journals on the course. This shows the visibility of the Journal. 2. In the middle of the box you can see who else has made posts in the journal and click on their name to view their posts. You may also use the [<] and [>] arrow buttons to move between people. Note that instructors by default see only their own posts and should click on the names of other users to see their posts. 4. To create a journal entry click on Create Journal Entry. 5. Enter a title and then fill in the larger text box with your entry. 3 embed a presentation from the SlideShare web site. 8. If you wish you can attach a file by using the Browse My Computer button. 9. Click on Post Entry to finish.